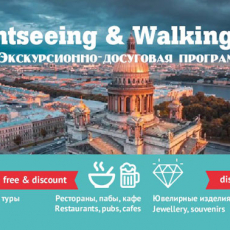 Program SIGHTSEEING & WALKING CARD (SWC) from «Art-Scandia LLC» provides its holders with up to 50% discount or free of charge services for bus and boat tour operators in Saint Petersburg, included in the SWC. Besides the card includes more than 60 sites and offers from the partners with discount up to 50% for following deals: private tours, art museums and art spaces, restaurants and cafes with discounts, restaurants with Cashback option, jewellery, souvenirs, and gifts. We will deliver your SWC card to any address in Saint Petersburg in 48 hours or less after you send the request with your address and contact number to info@art-scandia.ru. Please contact us at +7(965)7786002 for any further information. By clicking “Order” you agree with the Terms and Conditions of SWC program and processing of personal data. Read “SWC: Rules and Conditions” at the end of the page. 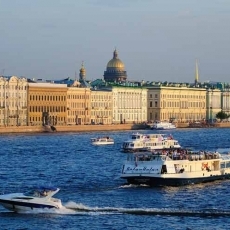 Following program includes free and up to 50% discount offers for deals from bus and boat tour operators in Saint Petersburg. Important! To get a discount for a city tour you have to get SWC card (after you purchase it) and provide a code on the back side of your SWC card. You’ll feel yourself as a native with us! 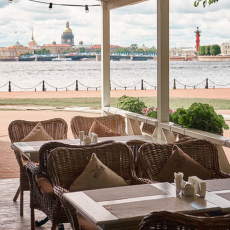 We always strive to show not only popular touristic places, but also informal St.Petersburg. We’ll design and conduct private tours for your family or company. Find more on the pages of this web-site. №15 - Ostrovsky square / Alexandrinsky theatre 15 major landmarks of the city from the 2nd floor of a bright and comfortable double-decker during of an unforgettable tours! Hop on and hop off at any of 15 stops during 2 days. Audioguide in 11 languages. Fixed schedule. Year-round. 1. Festive Petersburg and the Gulf of Finland. Lunch cruise. 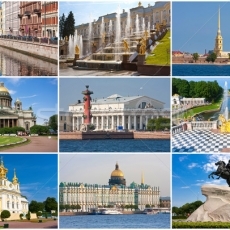 Ticket sale for this tours is one valid at the stop №1 «Palace Square», berth «Pier with Lions» (2, Admiralteyskaya emb.) with discounts (as above) upon presentation of SWC. In this section you may find the offers to visit unusual and unconventional museums and art spaces and platforms in Saint Petersburg. Loyalty Program: Discount -250 rub or 2nd ticket as present! Additional: Pre-booking of tickets is required! Dress-code! Concert, museum and buffet in the Cultural and Historical Center. 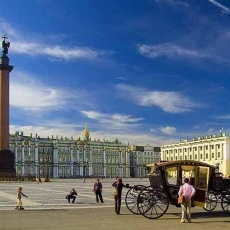 Excursion about Romanoff family, classical music concert, champagne… Near the Nevsky prospect. Loyalty Program: A shot of Russian vodka and traditional Russian snack – as a compliment! 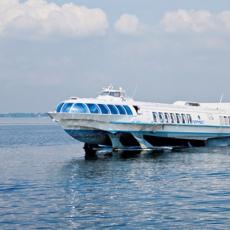 Additional: High season (June – August) – pre-booking excursion is required! The museum exposition details the history of the origin of the most famous Russian drink. You will learn about the production and drinking traditions of the Russian people. Here is the largest variety of Russian vodka in the world – more than 260 types. An integral part of the museum is the restaurant «Russian Vodkaroom №1». It’s first large historical scale model in Russia it a scale 1 in 87, 500 square meters in area. Permanent exhibition represent reconstruction of the most significant sights of St.Petersburg and suburbs. The main peculiarity of the scale model is over 20 tons of real water, representing the waters of Neva and Gulf of Finland. Additional: Please make pre-booking Branch of the first in Russia Museum of the Cat. The first cats café in Russia since 2001. Active cats therapy in the company of 25 cats and 0f 17 cat breeds, including the Hermitage cats. A place for creative people of St.Petersburg and tourists (more than 100 thousand visitors annually). You can touch, play and pictures! Additional: Excursions are evry hour. Pre-booking by phone is desirable. What is John Lennon’s favorite coffee, why the Turkish clergy called coffee as «black blood of the devil»? You’ll learn all this and much more about history of a magical drink y visiting our Coffee Museum. Also you can take part in our tasting programs. Additional: Tours beginning - 11:00, 12:30, 14:30, 16:30, 18:30; pre-booking is not requiered The mission of the museum (1st in Russia and 3d in the world) to discribe about rich world of spices, to show how the world influenced humanity and contributed to the development of gastronomic culture. During the tours you’ll rediscover the usual spices and get acquainted with exotic spices. It’s one of the yaung and developing galleries of St.Petersburg. The gallery presents works of both beginners and accomplished artists. All exhibitions in the gallery are accompanied by workshops theatrical and poetic performans. Gallery organizes high-level exhibitions, including works of foreign artists. The gallery implements author’s works of fine art and arts&crafts. Goals of gallery are participation in the creation of an actual culture of the city, support for contemporary authors and strengthening of creative links between Russian and foreign art community. For 24 years Borey Art Gallery is developing art culture among general public. Everyone who has visited gallery say that it’s necessary to come here to feel the breath of contemporary art in St.Petersburg. Art-projects (culture&creativity space) It’s a multyfunctional and creative project amming to development of the cultural component of the city live. It’s a diverse place for local people and guests of the city. The chamber platform created to support contemporary performing art. The studio program includes performances by prominent performers from Europe and presentations of works of local young artists. One of the first class and respectable pub of St.Petersburg. More than 40 kinds of English ale and beer. European cuisine. Customer’s favourite – supper-pepper steaks and game from the chef! On-line broadcasting of sport programs on the big screen. Restaurant of signature Mediterranean cuisine. Great choice of sea food. Regular parties are on Fridays and Saturdays. VIP room for 20 persons. Summer terrace. Classic Greek tavern is with a wide choice of meat dishes and seafood. 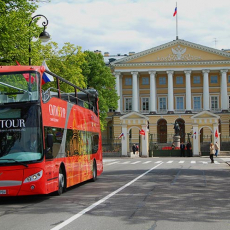 It’s quite inexpensive and democratic place on the main route of your walk – Nevsky prospect. Greek cuisine restaurant. Incredible buffet for which worth deviate from the main tourist routes. Loyalty Program: Compliment for the ticket! Walking in the center of the city, please come to the restaurant «Italy» on Bolshaya Morskaya street. If you present the ticket in the museum or theatre (from the list bellow) you’ll receive a compliment from the restaurant sommelier when ordering on the menu*. It’s a multyfunctional and creative project amming to development of the cultural component of the city live. It’s a diverse place for local people and guests of the city. Hellish place with Mexican food..
We are offering you the restaurants, visiting which you can get partial refund from your bill according to information on the SWC booklet page of each restaurant. SWC program includes 22 restaurants of Stroganoffgroup and international chain of Ginza Project restaurants in the heart of Saint Petersburg. Partial refund can be received only if you’re booking a table by phone: +7 (965) 778-60-02. You will need to provide pre-booking information: name of a restaurant, date and time of your visit, number of seats at the table and your preferences for the sitting (on the terrace, at the window, away from entrance, etc), which will be taken into account if possible. Partial refund applies to orders from the main menu (a La carte). The refund does not apply to restaurant’s business-lunch, tourist and discount offers. To get a refund you have to keep the bill and send its copy with your signature to the following email address: info@art-scandia.ru. Do not forget to state your full name and your phone number. After transaction completed you will receive a phone message and an email to the address you used to send a copy of your bill. Partial reimbursement is made only under the terms mentioned above. In case the conditions are not fulfilled (lack of information in email, missing signature on a bill) the refund transaction is not possible. The SWC operator is not responsible for mistakes in information you provided in the email (name, phone number). The iconic restaurant of Russian and American cuisines. Wide choice of firm steaks, original Russian snacks and drinks. The interior is made in the style of prerevolutionary Russia from wood and leather. This gives an atmosphere of warmth and hospitality. As well as, 20 restaurants in the heart of Saint Petersburg from the international restaurant chain Ginza Project are waiting for you! See more on the SWC booklet pages. Chain of souvenir stores «HERITAGE» is 25 years old! It’s the encyclopedia of Russian arts and crafts. We are the flagship in Russian market of souvenirs. «HERITAGE» offers great choice of Russian products in 6 stores in the heart of the city! The oldest chain of jewelry stores of St.Petersburg (We are 80 years old!). Wide range of jewelry (diamonds, gold, silver, amber..) in the all chain stores. Quality guaranteed by Russian jewelry traditions. Find regular discount programs at the web-site www.juvelirtorg.spb.ru. For example, there is a 30% discount till the end of this year for any jewelry with the precious stones semi-precious stones, marked with a red price tag. Sightseeing&Walking Card (SWC) you are holding is a city tour and entertainment program designed by “Art-Scandia” tour operator. 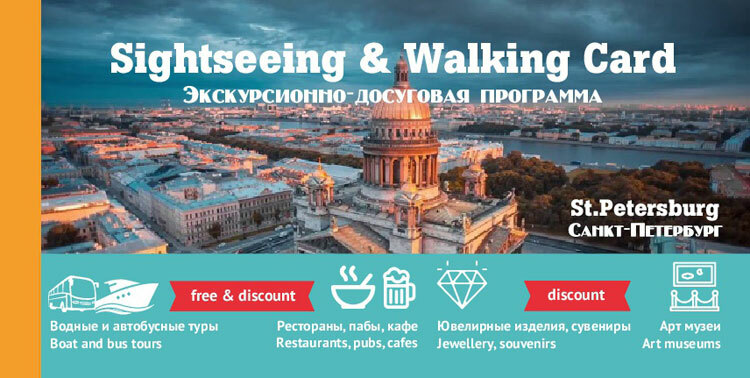 The holder of this card is entitled to attend bus and boat tours included in this program in Saint Petersburg for free or at a discount up to 50% before the expiration date stated on each offer’s page in this SWC booklet. Tours, included in the SWC program, may be used as separate deals as well as combined with other deals from the booklet at your choice. The boarding is possible only after presenting a ticket from a tour operators. In order to get a ticket for any tour, you should present this card at a venue mentioned on each offer’s page inside this booklet. When choosing free offers cashier will keep the tear-off part of the voucher for the tour you have chosen from the booklet. The Card’s offers do not have a rigid date of expiration comparing to the other travel programs. It’s available to you at any time convenient the majority of the offers are valid until March 2019. Attention! Some of the booklet offers might be seasonal. Please read carefully the information on the offer’s page while choosing it. 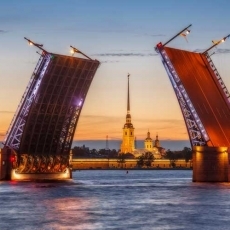 In addition to the city tours SWC includes gifts, compliments, and discounts for our partners’s deals such as: private tours (including St. Petersburg suburbs), art museums and creative spaces, restaurants, pubs, and cafes, souvenirs and jewelry. Expiry date of loyalty programs are stated on each offer’s page in the booklet. SWC is intended for personal use only. Offers from the SWC booklet cannot be combined with other discount offers from our partners (unless the contrary is stated on the partner’s offer page). Art-Scandia tour operator does not take responsibility for our partner’s inability to provide the service in case of force-majeur situations, however we will make everything possible to provide the information about any changes in the program on our website. The Sightseeing&Walking Card brochure is not available for refund or exchange! Art - Scandia Ltd (tour operator) gurantees that we use and store your personal data (including your name, phone number, and email address) only for you to use Cashback option while visiting the restaurants of Stroganoffgroup and Ginza Project, without giving your data to third parties, we take responsibility for our confidential policies in accordance with the law of Russian Federation. If you wish to keep your personal data confidential you are able to use all discount offers for the restaurants, pubs and cafes without using Cashback option. All additional personal data used while purchasing Sightweeing&Walking Card on a website www.b-abo.ru is stored and processed under the responsibility of the website’s owner.